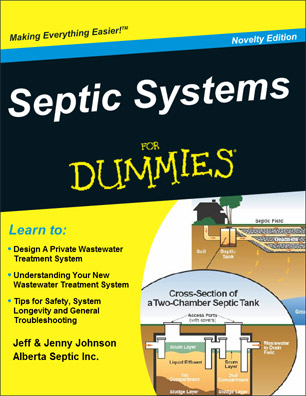 Uncategorized | Septic Systems For Dummies – Complements of Albertic Septic Inc.
Septic Systems For Dummies – Complements of Albertic Septic Inc. Your trusted source for certified septic systems and excavation services throughout Central Alberta. Alberta Septic is thrilled to begin the 2019 construction season with an exciting announcement! We recently purchased our very own line locate equipment! Our line locate equipment will allow your project to proceed in a timely fashion and avoid costly, dangerous mistakes. Safety and quality are always our number one priorities. Accordingly, we have a record of excellence and a solid history of satisfied customers. Please note: Alberta 1 Calls will still be needed. Our intent with this equipment is to be able to verify the marked locations of buried utilities within our work areas, and locate customer owned lines that Alberta 1 Call does not cover. If you have any excavation, septic, or earth moving needs in 2019, please give us a ring! Alberta Septic – a small, family company with a big heart! 1) As a homeowner, you are 100% responsible with complying with Alberta’s Private Sewage Standard of Practice. 7) Maintenance – an ounce of maintenance is worth a pound of cure! Sound confusing? It can be! Let Alberta Septic and Excavating take care of the details and plan a proper system that complies with Alberta’s standard of practice! We are booking now, so call today! source: Safety Tips. (January 2012) . Private Sewage Treatment Systems. [Brochure] Government of Alberta. Spring is coming, although you wouldn’t know it by looking outside! Now is the perfect time to book Alberta Septic & Excavating for any septic or excavating work — Beat the rush and call or email us for a quote today! 1) The pipe from the house to the tank. 2) The septic tank itself, and/or the pump. 3) The pipe from the tank to the septic field. 4) The soil treatment system (the septic field). To prevent freezing simple tactics may be employed. For example, running water (warm/hot) can melt lines that are beginning to freeze. Simply taking a hot bath or spacing your laundry out can do the trick. Leaky plumbing fixtures should be fixed to prevent additional freezing outside the pipe. Also, ALL types of vehicles should remain off your system year round to maintain the integrity of the field. DO NOT, however, add antifreeze or salt to your lines. DO NOT pump out your sewage over the frozen ground. DO NOT start a fire over the system in hopes of thawing it out. DO NOT run water continuously (see tips above with regards to water usage). Stay warm! As always, if you have any questions or need advice, please don’t hesitate to contact Jeff. As we enter this festive and busy season, we want to take the time to thank all of you -our valued customers- for your business in 2017. You are an integral part of our enterprise and we would like to extend heartfelt gratitude and appreciation for your support. We wish you all a prosperous, healthy and happy 2018! Merry Christmas! and thanks again for a wonderful year. The snow has started to fall and, with it, the temperatures are about to plunge: Old Man Winter seems to have arrived! With the changing season, the ground will freeze up and homeowners may be wondering what they need to do to prepare their septic system for winter. In the past, people have dumped anti-freeze into their tanks. However, this is not only unnecessary, it also disrupts the delicate balance of bacteria and unpleasant issues may result. The tanks are designed to be buried to a depth that will prevent them from freezing in the winter. Nonetheless, a thorough evaluation of the cover should be undertaken. If it is above ground, quickly examine it for cracks or if it is loose in any place. If it is below ground, it can be appraised when the system needs to be pumped out. Again, take care to avoid driving over your septic field (especially when plowing snow). A compacted field will not drain properly and will not be as effective. The cold months are a great time to hibernate, but don’t forget to quickly inspect your system first. An ounce of prevention is truly worth a pound of cure! As always, call Alberta Septic & Plumbing if you have any questions or would like your system inspected! Visit www.albertaseptic.com for all your septic and excavation needs throughout Central Alberta.